August 22, 2013  Lobsters are Maine's signature industry, but it's Canada who seems to be doing the better job of marketing its crustaceans. 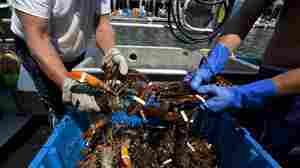 And as Maine lobstermen face record-low prices, the state is hoping to take a few lessons from the success of its northern neighbor. December 3, 2012  Gotcha! An underwater camera caught large Maine lobsters gobbling up their younger brethren along the coastline. Biologists think this turn to cannibalism may be due to a recent spike in the Maine's lobster population, combined with a decrease in the numbers of their natural predators. September 12, 2012  Flying with lobsters is surprisingly easy, as long as the journey isn't too long. 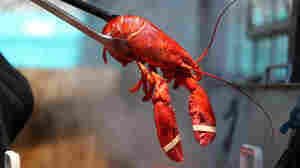 And this year's glut of Maine's soft shell lobsters means it's also cheaper than usual to bring them home alive. August 11, 2012  Protests at Canadian seafood processing plants stymie Maine lobster trappers, and after a summer seafood supply glut, an escalating price war is preventing trappers from getting their goods to market.